Alexandra (Alya) Rozenman was born in 1971 in Moscow, USSR. Not without political disagreement she was classically trained in a Soviet Art Academy but later on also studied with today well-known dissident artists from Moscow underground movement. Still a teenager she became part of Moscow alternative cultural scene of the 1980’s. Later she immigrated to the U.S. She lived in New York in the 90’s being a part of what later became The Art Alliance program on Lower East Side. Rozenman received her BFA from SUNY in 1993. Later she relocated to Boston and received an MFA from the School of the Museum of Fine Arts in 1998. Her paintings and drawings blend the styles and symbols of folk art, Russian Underground Conceptualism, illustration, and Jewish Art. She received a MacDowell Foundation Fellowship in 2006. 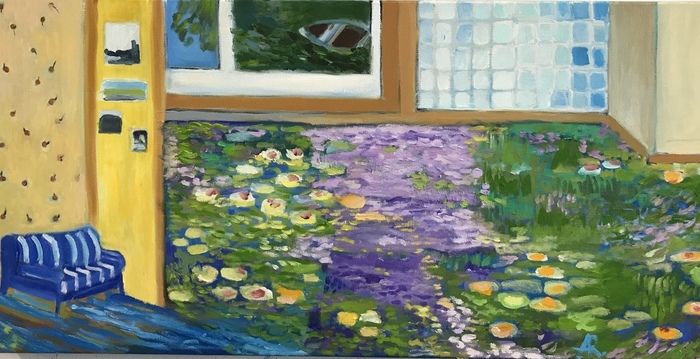 Rozenman exhibits both nationally and internationally, including recent venues at Trustman Gallery in Simmons College in Boston, Fountain Street Gallery in Boston and Hudson Gallery in Gloucester, MA. She is a member of Fountain Street Gallery in Boston. The subject and color palette of “Falling in Love with Matisse (after the conversation)” evokes world-known painting by Matisse called “The Conversation”. 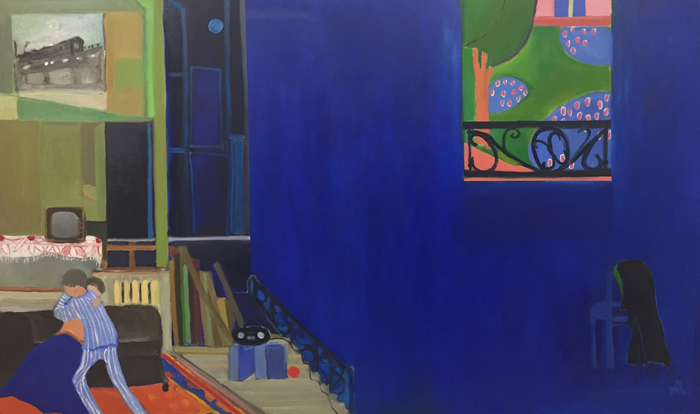 “Our first Harvest in Paris” by Alexandra Rozenman is a surreal and playful horizontal 48 x 24 x 2 inch. oil painting on canvas. Two beautiful spaces are united into one powerful image. On the left of the painting is a bluish night landscape with a big family of goose running either from something or towards something – we can’t be sure? On the opposite side of the canvas, creating the border is a cozy and welcoming interior of an empty house with wooden floor, green antique walls and a window with an iron balcony and a view of Paris, the city of Love. On the bottom of the right side, close to us there is a couple digging into the imagined garden or may be picking up the harvest. A soccer ball rests next to men’s leg. Do people plant flowers in soccer fields? In Paris, you never know. The beauty of understanding each other, building up the new life on a new land, gardening, home, migration all come together in this powerful narrative painting. But as in many other paintings by Rozenman this piece has a second layer. Its composition, as well as subject, recall a famous painting by a French XIX century painter Gustave Caillebotte, Raboteurs de parquets, 1875. (Floor Cleaners). It wants to connect past with the future and love with hard work.